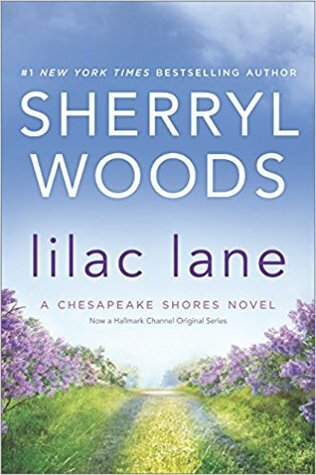 Lilac Lane is book 14 in Sherryl Woods’ Chesapeake Bay series. I have read and enjoyed all of the books in the series and this book can be read as a stand-alone without confusion but the entire series is so good, I think that you’ll want to start with book 1 – you won’t be disappointed. The Chesapeake Shores series is about a town in Maryland that was built by the O’Brien patriarch, Mick. Mick’s main goal in life is to have his 5 children married and in love with the person he picks out for them. Once that is accomplished in the first books of the series, he starts meddling in the lives of other family members and gets help in his meddling from his children and their spouses. In book 14, it’s single mom Kiera who lives in Ireland and raised her three children. Her daughter Miora lives in Chesapeake Shores with her husband Luke O’Brien. Moira feels that her mom has given up on finding happiness and asks her to come to the US to help take care of her granddaughter. Once she arrives, sparks start to fly between Kiera and the cook at the O’Brien pub. Will Moira be able to convince her mother to stay in America and take a chance on happiness or will she return to her solitary life in Ireland? It was great to get back to Chesapeake Shores and the O’Brien family in Lilac Lane. This is a fun series with characters that are very likable who believe strongly in love and family. With two other careers to her credit before becoming a novelist and four states in which she's lived for extended periods of time, Sherryl Woods has collected friends and memories, along with way too much unnecessary junk. The theme of enduring friendships and families is always central to Sherryl's books, including her latest Chesapeake Shores series — THE INN AT EAGLE POINT, FLOWERS ON MAIN and HARBOR LIGHTS. Author of more than 100 romance and mystery novels, Sherryl Woods grew up in Virginia. Over the years she had lived in Ohio and Florida, as well as California. Currently, she divides her time between Key Biscayne, Florida and Colonial Beach, Virginia, the small, river-front town where she spent her childhood summers.